wIn regard to effects, always remember that an audience wish to be entertained so never ask them to think or remember to any great extent." Jack Merlin, "And a Pack of Cards"
Indirect proof is fine for ancillary aspects of an effect. But when you re dealing with something that pertains to rhe whole point of the effect, you need direct proof. 0 you point out that twelve from twenty equals eight, therefore, the second packet must contain eight cards, people are likely to think, "Well, yeah, I guess." If, instead, they see the packet counted, they know how many cards it contains. & There is undeniably a lot of counting in this trick. Magicians tend to feel that counting piles of cards is boring. In most tricks, they'd be right. However, Cards Across is about the number of cards. Counting the cards is how the audience experiences what has happened. The alternative, discussed above, of having the spectators add, subtract, deduce, conclude, and surmise, distances them from the magic. Don't turn this trick into an arithmetic lesson and a series of abstractions. Make it a concrete miracle. Let them see, hear, and feel the magic by counting those cards as much as necessary to drive home what happened. 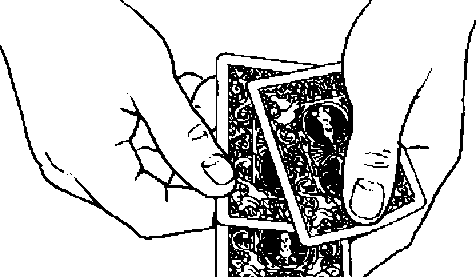 Harris' main contribution was the ingenious application of an old false count, traditionally performed by the magician, to allow the spectator to count one of the packets without the performer touching it again, (Most versions of Cards Across allow the spectator to count the cards but require that the performer handle them afterwards.) Almost as important is his way of justifying the procedure as an alleged casino practice. Bill Malone's contribution was the application of the half-pass to allow the second spectator to also count her packet without the performer touching it afterwards. My contributions are: the use of red cards and black cards to permit identifying which cards traveled across; the method of transferring cards from packet to packet; the Hamman count convincer; and the use of the bottom deal to distribute the reds among the blacks.